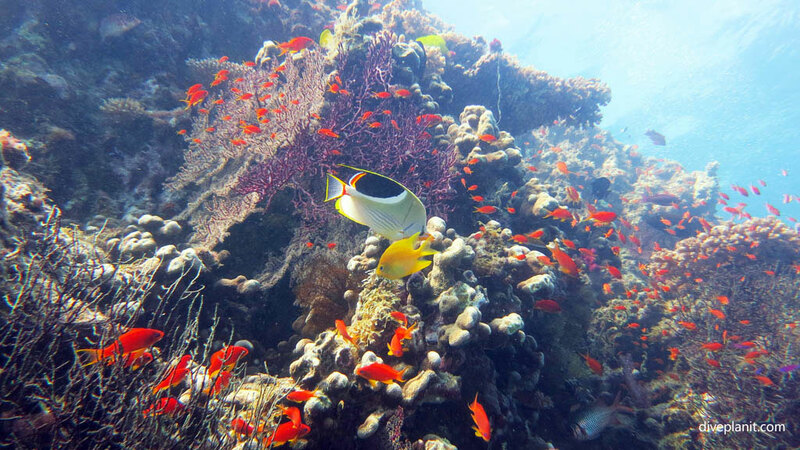 The diving at Savusavu is known to be among Fiji’s best, but Vanua Levu – Fiji’s second largest island – holds two of Fiji’s best kept secrets as far as scuba diving is concerned. 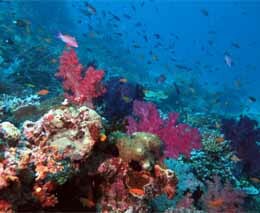 These are the Great Sea Reef and the Namena Marine Park and we’re guessing you’ve heard of neither. The Great Sea Reef is the third longest barrier reef in the world, and arcs 200 km from the top of Vanua Levu towards the tip of the Yasawa Islands. [hyp] After fish populations declined due to commercial fishing, a series of Marine Protected Areas have been created and fish populations are bouncing back. 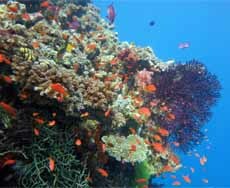 You can dive the end of the Great Sea Reef from a resort on the north of Vanua Levu. The other secret is the Namena Marine Reserve. Think of it as Fiji’s Sipadan, an island surrounded by a tongue of reef that extends 20 km south from Vanua Levu into the deeper Koro Sea. This isolated island sits almost on the middle of a line drawn between Rainbow Reef and Vatu-I-Ra. Since TC Winston, there is no resort on the island, but Namena MPA is accessible from the Savusavu dive resorts. 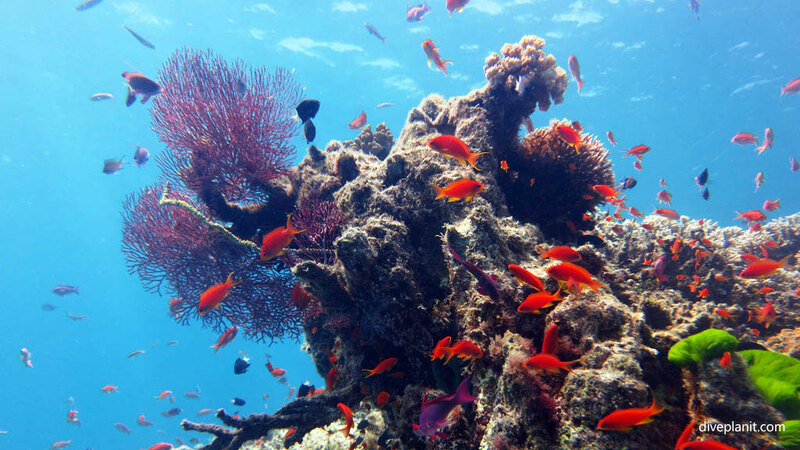 Vanua Levu’s other great marine treasure is the world famous Rainbow Reef though it’s often associated with Taveuni, (from where it’s very logistically accessible). The resorts of Vanua Levu are quite spread out and conveniently located on the map top right. If you want to dive the Great Sea Reef your options are limited. The Nukubati Island Resort is a luxury resort on a private island. It’s the kind of place where you pretty much determine how your holiday runs. It’s accessed via Labasa airport. An alternate option is Captain Cook Cruises Fiji’s ‘4 Cultures Discovery Cruise’ aboard the MV Reef Endeavour – a cruise which circumnavigates Vanua Levu. 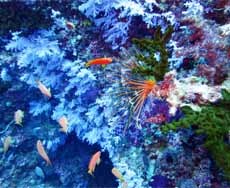 You’ll get one or two dives on the Great Sea Reef, as well as many others all around Vanua Levi (Rainbow Reef and Namena Marine Reserve). 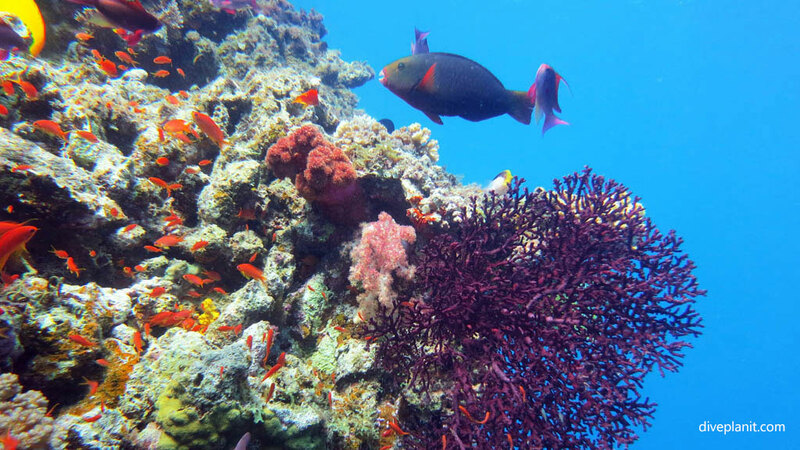 There is plenty of great diving on the reefs just outside of Savusavu – just look at the Savusavu Bommie site below – and the four resorts based in that area also make day trips to the Namena Marine Reserve and Rainbow Reef area. The four resorts are: Jean Michel Cousteau Resort, the well-known luxury dive resort; the Koro Sun Resort, which is home to Namena Divers; Namale Resort & Spa which has its own dive centre on site; and Savasi Island Resort home to KoroSun Dive. 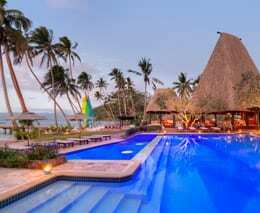 Finally, there are two modest resorts on the south east of Vanua Levu very cloase to Rainbow Reef, though both resorts are most easily accessible from Taveuni. Sau Bay Fiji Retreat, nestled on the shore of a private cove, offers weddings, honeymoons, soft adventure – and scuba diving via their own on-site dive operation. 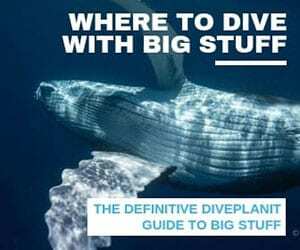 At Dolphin Bay Divers Retreat the accommodation is more humble but obviously they have the Rainbow Reef on the doorstep and offer two tank dives every day. 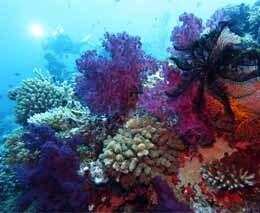 There is more information on the Great Sea Reef and particularly efforts to protect it on this WWF site. The Namena Marine Reserve has its own website. If you are going to Nukubati, fly to Labasa and the will arrange your transfer as part of a package from there. Savusavu airport is conveniently located for all the resorts in the Savusavu area. To get to the two Rainbow Reef retreats on Vanua Levi, fly to Taveuni’s Matei airport on the northern tip of the island, and take road transport down to the wharf where the resort boats wil meet you. Both Fiji Airways and Northern Air have flights to Labasa, Savusavu and Taveuni.